The doors were opened, the cool air blew through the house, and thoughts of freshly-made soup floated through my busy head. Fall-time finally arrived this weekend! Last weekend, I visited the pumpkin patch wearing shorts and baked pumpkin doughnuts while sweating in the kitchen. Although they were delicious even with an extra sweat drop or two. This weekend, I rummaged through my closet in search of early morning sweaters, baked warm crusty bread, and lined the table with bowls of steamy soup. Did I mention bundled up in a cozy sweater without one drip of sweat? With fresh thoughts of soup dancing through my head this weekend, I remembered the big bag of bones, from a local farm, sitting in my freezer. It’s funny how things change. A few years ago I would have been horrified at the thought of animal bones in my freezer. Now, I eagerly anticipate pulling out pounds of cow and chicken bones to make nutrient-dense, flavor-packed broth. 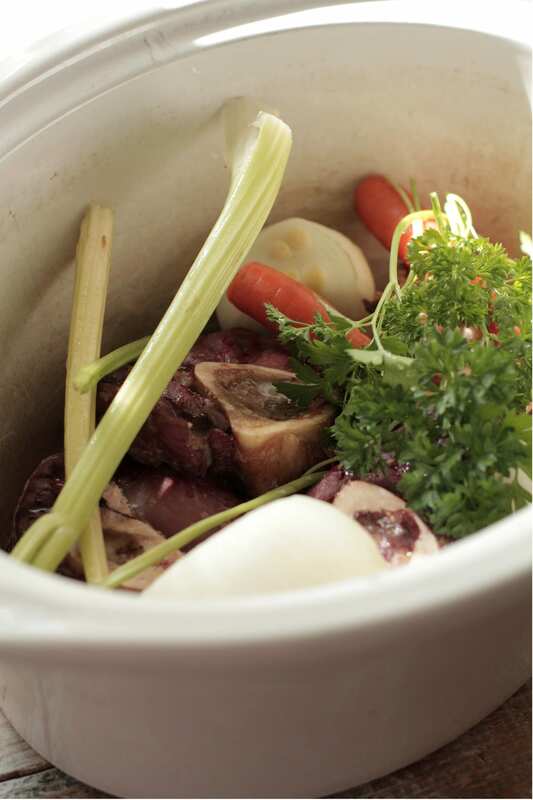 The best soups are made from delicious, nourishing homemade broths. 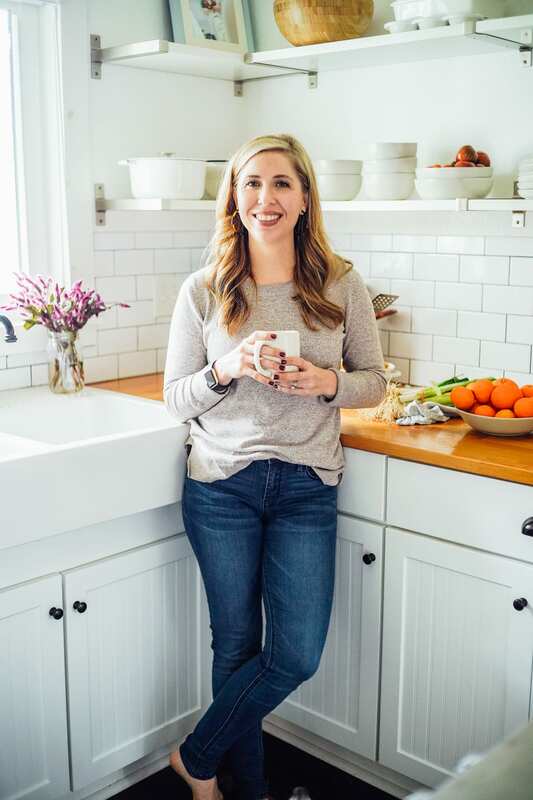 The cans and boxes of broths lining the grocery store shelves simply can’t compare to the goodness of homemade broth made from the bones of pastured animals. Not only does the taste differ, think about the price. I paid $3 for the big bag of bones in my freezer. Yes, $3! In fact, the farmer was so happy someone actually wanted bones he probably would have just given them away. $3, a few minutes of prep in the kitchen, and a night of simmering in the “Kitchen Maid” (my beloved crock-pot), by morning I have cups and cups of nutrient-dense broth. In the days before ours, the days of great-grandma, an animal’s life was valued and every part of the animal was used. Meat was eaten, fat was rendered, and bones were saved and made into broth. When we think of returning to the food and health days of great-grandma, I believe our minds always shift to processed food. But, our philosophy must go deeper! Would great-grandma recognize boneless skinless chicken breasts? Probably not! Where are the valuable bones to make broth to nourish the body? Would great-grandma recognize the beef we stock in our freezers, ground beef? Probably, but she’d wonder: Where are the roasts, the odd pieces, the fat, the extra bones which made up a large part of the animal who gave its life. So, in the spirit of cool weather, nourishing our bodies, and returning to the food days of great-grandma, we are going to make broth, with bones, from an animal. Preheat the oven to 375°. Place the bones on the roasting pan. Yes, you need to touch the bones. Great-grandma (and your husband) will be proud. Roast the bones in the oven until they are brown, about 20 minutes. They will smell delicious, just like steak! Crock-pot time! Place the bones in the crock-pot. Next, wash the veggies. No need for chopping. I simply break them in half with my hands and leave the herbs whole. The onion will need to be halved. Add salt and a few peppercorns, for taste. Place the veggies on top of the bones. Fill the crock-pot with water and turn on low for ten hours. Thank your “Kitchen Maid” for working so hard, she deserves it. After ten hours, strain the veggies and meat to separate from the liquid. Don’t discard the bones. You can wash new veggies and use the bones one more time in the crock-pot to make another batch of broth. Your broth should be fragrant and rich golden-brown color. Place the broth in the fridge for 24 hours. A white substance, a protective layering of fat, will rise to the top. Remove the layer of fat. Underneath you will find delicious bone broth just waiting to be used! I store my broth in mason jars and freeze until needed. 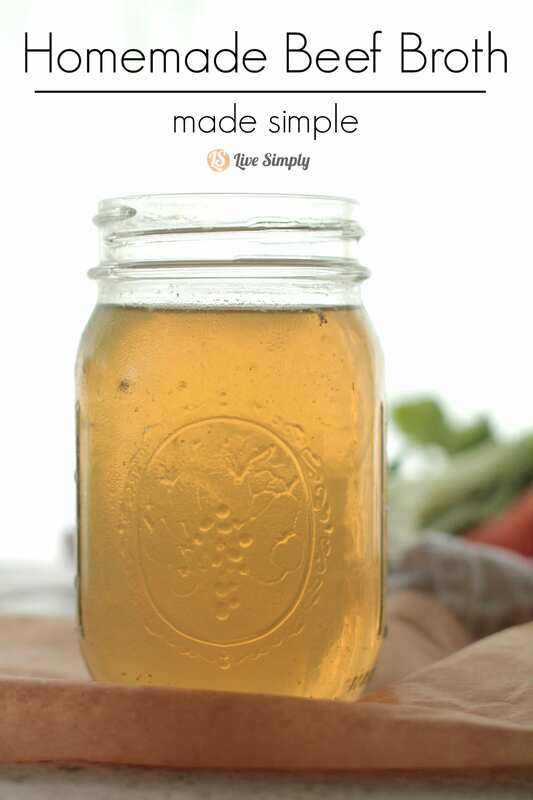 When using mason jars to freeze, allow the broth to fully cool before freezing and leave plenty of room at the top for expansion of the liquid. Break out the dutch oven, bake the bread, and chop the veggies, we are having soup tonight. Thank you so much, Teri 🙂 I’m so happy to hear that. Loved talking with you the other night! After using the bones to make broth twice, is there anything else that can be done with them? Thanks for sharing, Jojo. Does this also apply to beef bones? I’ve always been instructed by our vet that beef bones are okay? I am excited to try making broth this weekend! Do you can the mason jars in a water bath before you freeze for your broths (chicken and beef) or just put the lid on and freeze? I use my broth pretty quickly, so I just place in mason jars (fully cool) or zip-lock baggies and freeze. After you use the bones once, do you put them in the fridge or freezer until you use them the 2nd time? I immediately make a a second batch with new water and veggies and the old bones, but I think you could safely keep them in the fridge for a few days before making a second batch of broth. 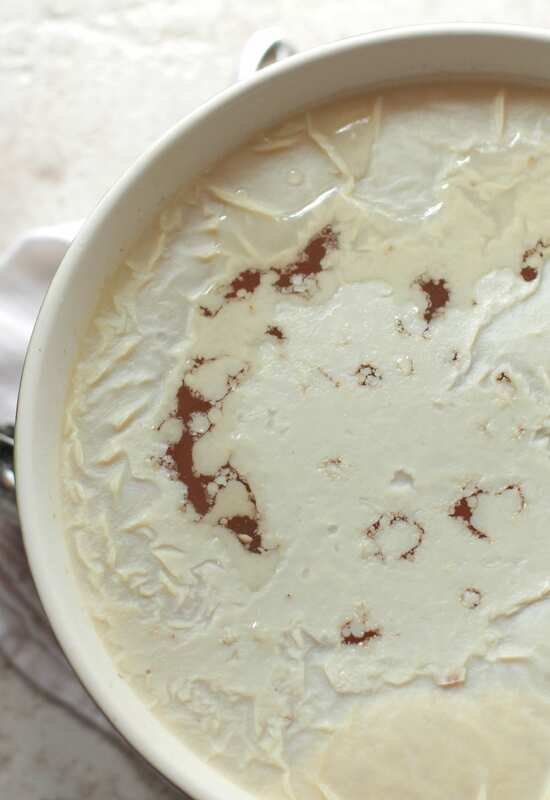 I am making this today with my soup bones from our side of beef. I plan on making a second round of broth as well when the first one is done. I am just curious as to what you do with the meat that is on the bones when it is all done and the broth has been separated. I would love to make a stew with it right away and wondering if you have done something similar. My soup bones are very meaty! Thank you! I reserve the meat and use in soups or mixed in dishes. 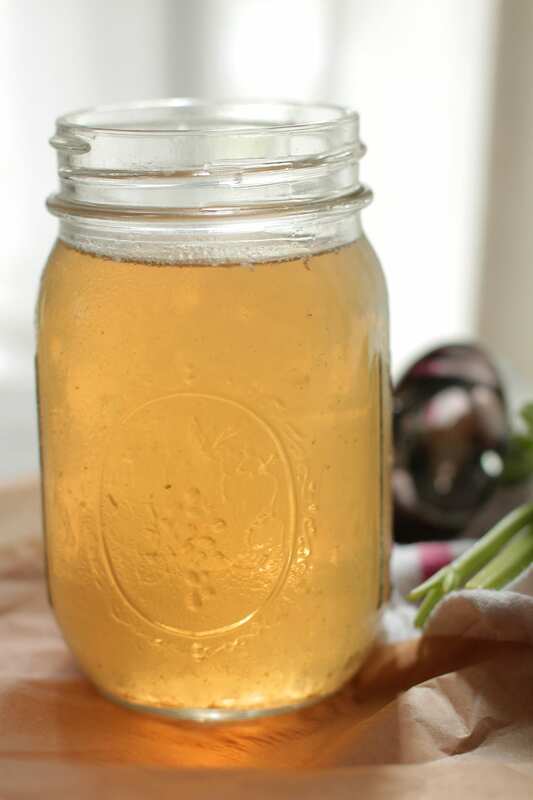 How come your beef broth is so clear? Hey Millie, The lighting in these pictures does the true color of broth an injustice. It’s actually much darker. The color will also depend on how long you cook the bones. I have a bag of bones in my freezer that I have been working up the courage to use to make broth but I am curious as to how many bones you use in one batch? Thank you so much for all of the advice and information you give to us! 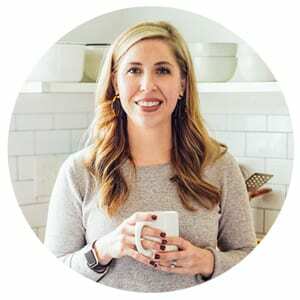 Hey Kristi, I use a couple of pounds of bones per batch. So, about 4-6 bones (or more). Broth making gets easier and easier (and less intimidating) each time you do it :). Happy broth-making! Hi, I just made my first batch of bone broth but am disappointed. I thought the broth would be really rich but it taste quite watery. I used 4 bones I roasted, lots of carrots, onion, garlic, bay leaves, fresh thyme, salt, pepper and a whole celery heart leaves and all. I cooked it for 11 hours but it isn’t very dark or concentrated, any ideas? Oh no. It shouldn’t be watery when tasted. If you still have the bones I would add them back to the crockpot or a soup pot with the broth and cook for another few hours on high (stove top) and longer in the crockpot. The broth is still usable too, as is. The taste just won’t be as strong. Awesome, Debbi! Thank you for sharing! Is there a reason that you get rid of the fat? I was told the fat in homemade broth was a good fat and it was actually recommended that I use it in recipes for my baby. I haven’t made any yet but plan to this weekend!! Hey Emily, It’s really just a texture and taste issue. You can definitely leave the fat in the broth, but it will have a greasy taste and feel if it’s used in soups. Just to add (love your post! 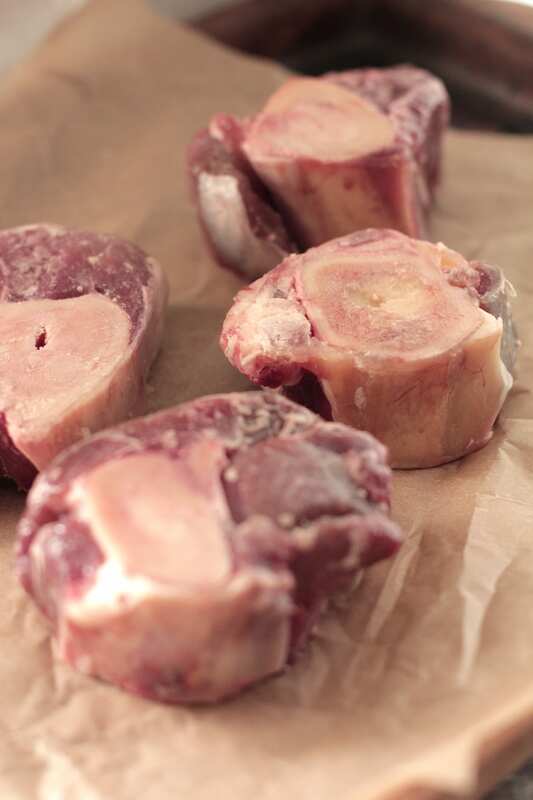 ), I like to use oxtail bones for my broth. I had difficulty finding them (and I live in Kansas); oddly enough, I found them at an Asian Market (which also has other interesting animal bones and meat, like duck heads….but that’s another story). Probably not small-farm raised, but superb for the task. I have found that 4-6 bones wasn’t enough to really make a rich broth for my taste. I end up using approx. 10 bones, which gives me the richness we prefer. Yum, Kimberly! That sounds amazing! Thank you for sharing. Hey L, You can definitely leave the fat behind. It’s a personal preference.